the earthquake and tsunami in Japan. When international students from Japan learned about the devastating earthquake and tsunami that rocked their country, they approached Hiroshi Yasuoka, International Education Advisor, to ask if the College was going to do anything to help. In response, Douglas College International, with the help of the students, set up a donation collection table in the concourse of the New Westminster Campus. These students, as well as students from the Office for New Students and other Douglas College students, volunteered their time to help collect donations. In the span of two weeks they raised more than $7,700, which has been donated to the Red Cross. But there was more to the campaign. When “Ruth” Xiao Wen Qiu, a student working toward her Associate Arts Degree, learned of the initiative, she came up with the idea of enlisting the Japanese students to make origami cranes, which she then arranged into the Japanese character for “love” on a flip chart. Douglas students and employees were encouraged to take a crane and write a message to Japanese earthquake victims in its place. Leaving a donation was optional. 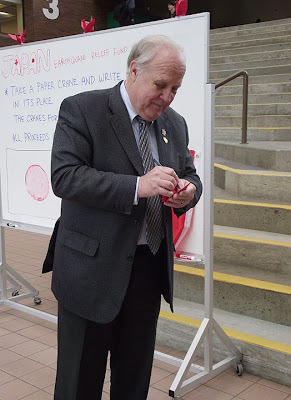 And then, when New Westminster Mayor Wayne Wright heard about the campaign, he paid a visit to Douglas on Friday to make a donation and pen a message of hope. He also expressed his appreciation of Douglas. Hiroshi Yasuoka would like to thank everyone who donated money and volunteered their time.